I have just prepared this material. It has been a hit with my kids and I really wonder if the children at the nursery will like these. The aim of the activity is to reinforce counting and consolidating child's knowledge of number symbols. I bought unfinished wooden ladybird shapes from a craft store and painted them with acrylic paint. 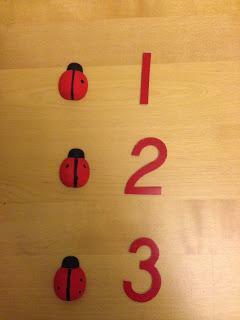 The child counts the spots of the ladybirds and matches it with the relevant number symbol. 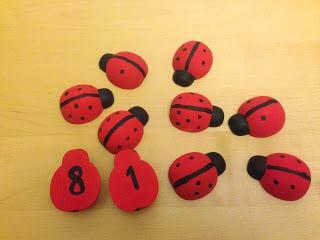 I also added the relevant numbers under each ladybird as a control of error element. So the child can check for herself/himself if what s/he came up with is correct or not.